A truly magical place and it’s not an exaggeration! 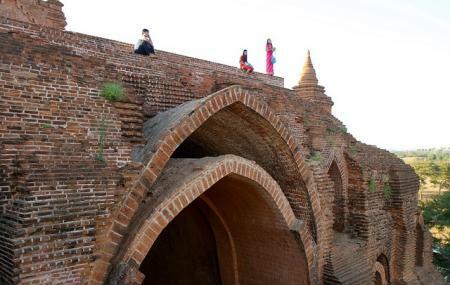 If you want to know how picture perfect Bagan is, then visiting Pya-Tha-Da Paya or Pyathagyi Hpaya is a must. The view of setting sun is quite ethereal from here and you’ll fall in love with the tranquillity of nature, all over again, once you pay a visit here. If you’re an avid photographer or an amateur who just knows to click pictures from the phone, you’ll love the locales this place has to offer. How popular is Pyathadar Hpaya? People normally club together Dhammayazika Pagoda and Minnanthu Village while planning their visit to Pyathadar Hpaya. You can no longer go up the internal stairs to view the sunset from the terraces. Was very disappointed when I arrived due to this reason. At the entrance to the carpark, there is a blue sign indicating another viewpoint 600m ahead. We went there to enjoy the sunset and temple spires could be seen on the horizon. The viewpoint was not crowded. Bagan in Burma is a wonderful and amazing place with thousands of stupas and temples. Pyathetgyi Pagoda is a much sought place for watching the sunset. It gathers hundreds of tourists every night. Hightly recommend to go and visit there. One of famous pagoda in Bagan.